Learn about Cross-Cultural Communication in International Business. Studying the course Understanding Cross-Cultural Communication in International Business offers learners advice and guidance for communicating effectively with work colleagues and individuals who come from different cultural backgrounds. The course starts off with introducing the concept of cross-cultural communication and its importance in the modern globalized workplace. Then the course will discuss strategies for identifying both similar and divergent cultural characteristics across different cultures, and why they play an important role in effective cross-cultural communication. Learners will be introduced to potential barriers to cross-cultural communication such as language, religion and food, and the course suggests suitable ways of overcoming them. Many professionals move abroad as part of an international assignment through studying this course they will gain insight on how best to prepare for moving to a country with a different culture, and effective strategies for living and working within a different culture. 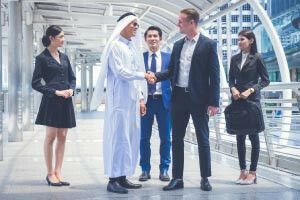 This course will be of great interest to all business professionals who would like a greater understanding of cross-cultural communication and how it plays an important role in conducting effective international business. Describe effective strategies for living and working abroad.